If you are a registered nurse looking to become a nurse educator, the Sinclair School of Nursing has created a new RN to MS(N) option. After completing the program, you will have both a bachelor of science in nursing and a master of science in nursing with an emphasis as a nurse educator. Graduates from the program will be prepared to teach in nursing programs and provide staff and community education. All courses are online to meet the needs of the working RN. With full-time and part-time plans of study, the program can fit your schedule. Our experienced academic advisors and faculty will work with you one-on-one to meet your individual academic needs, all the way from completing your general education requirements to enrollment in graduate level coursework. 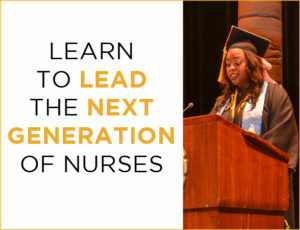 The Nurse Education Incentive Fund provides tuition for RN-to-MSN students who agree to teach in a Missouri RN program. Apply here! You’ll earn both your BSN and MS(N) in a shorter timespan, saving you money. Scholarships are also available! Students applying by April 1, 2018, are eligible to apply for scholarships to fund your education in return for agreeing to teach in a Missouri RN program. The University of Missouri is accredited by the Higher Learning Commission, one of six regional institutional accreditors in the United States. The RN-MS(N) at the Sinclair School of Nursing is accredited by the Commission on Collegiate Nursing Education.